This Unit is designed to boost directly from cascade cylinders or a high pressure compressor storage cylinders to outlet pressures of 4500 PSI. The unit ensures full 4500-psi fills even if the supply storage pressure drop as low as 500-psi. 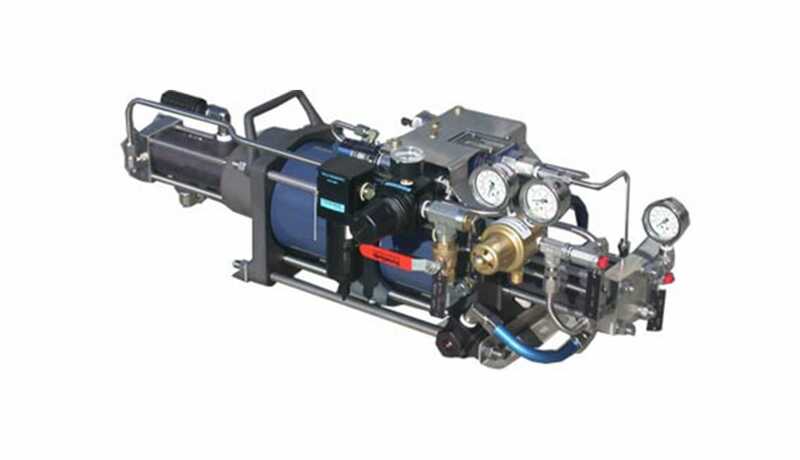 The unit is operated with a low pressure conventional air compressor; or directly from the high-pressure air storage supply. The high-pressure section of the booster is cooled by the drive exhaust air and operates dry, non-lubricated. In the shop air drive mode, non-contaminated outlet gas is assured because of complete dual vented separation from the drive section. All items are line mounted on to the booster. * Based on 90-psi shop air and 60 cycles per minute.